Steeped in tradition with the finest finishes. 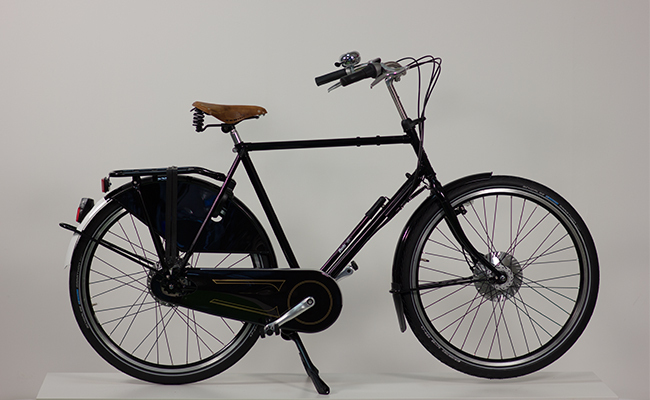 This classic Dutch Opafiets is designed for a smooth and elegant ride and comfortably upright position. The opa is built for durability and strength making it easy and comfortable to carry everything you need. 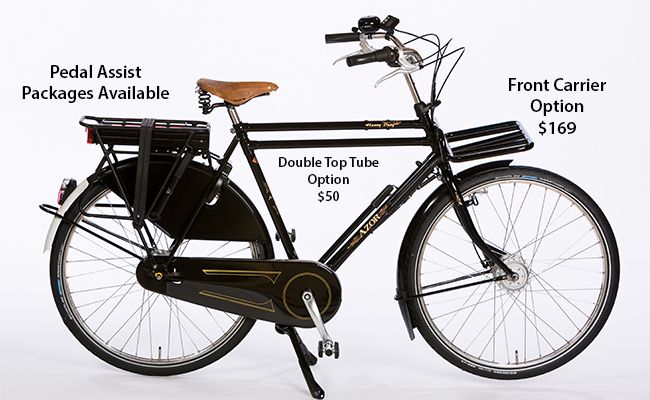 This luxury version includes Brooks leather saddle and grips, steering stabalizer, automatic front and rear lights, anti-puncture Marathon tires and beautiful stainless steel spokes and rims, the classic looking chaincase, as well as an ultra strong rear carrier with elastic straps.The Opafiets and Opafiets luxury is one of our most popular models with men thanks to its amazing comfort and nostalgic look. These are the exact same beautiful bikes that you will find in the streets of Amsterdam and all over Holland. Made in Holland, Brooks B67 leather saddle and grips, steering stabilizer, Hand-Soldered steel frame with oversized tubing,Tough three layer anti-rust powder coat finish, 28" wheels with stainless steel rims and spokes, Schwalbe Marathon anti-puncture tires, Shimano hub dynamo powered front light & rear light with stand light, fully enclosed chain case, fenders, skirt guards, Shimano front & rear hand operated roller brakes, axa rear wheel lock, shimano nexus 8 speed internal hub, heavy duty rear carrier (50kg) with the ability to mount child seats directly, elastic rear carrier straps (Snel binders), stainless steel handlebar, stem, bolts, nuts & cables.